Delinquency rates on credit cards are important because GDP is mostly driven by the consumer. If the consumer can’t borrow money to buy goods and services, a recession is in the cards. This is probably why the chart below has gone viral among the bearish investors. The delinquency rate on credit card loans among banks not in the top 100 by asset size has been skyrocketing. It went from 3.81% in Q2 2017 to 5.73% in Q3. Although, this is from small banks. Some investors who haven’t done the research likely think this portends something terrible. To determine if this has importance, let’s look at the results from the top 100 banks. As you can see from the chart below, the delinquency rate looks like it bottomed in Q2 2015 but is still very low. The bottoming of the delinquency rate hasn’t meant much as it bottomed in Q4 1994 which was 6.5 years before the next recession and Q4 2005 which was 2 years before the next recession. The top 4 banks have massive market share in America, so it’s not surprising to see the banks not in the top 100 have almost no effect on the overall number. As you can see, the total delinquency rate is 2.53%, meaning the small banks had an effect of 4 basis points on the total rate. This type of grasping at straws to suggest a linear relationship between cause and effect in an effort to fit a narrative is the type of misinformation we try to fight against with our content. Although we often get criticism for either not being bearish enough or bullish enough, we have no agenda other than to understand the progression of events and to have a historically accurate view. It’s easy to find any statistic or chart that fits a narrative, but doesn’t serve any analytical value. Does Savings Rate Portend Disaster? 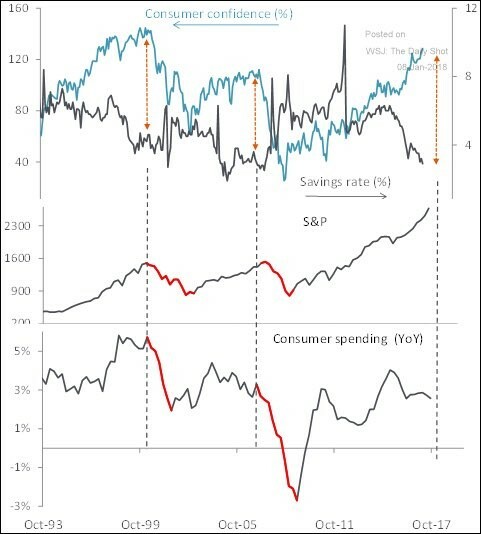 Another chart which is often shared is the consumer savings rate. It has been declining for decades partially because interest rates have declined, forcing people into risk assets such as bonds and stocks. As of December 2017, it was at 2.4%. The chart below makes it look like the economy is about to go into a recession because of where the dotted lines are placed. 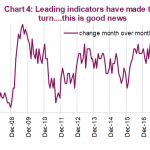 However, it’s important to recognize that a declining savings rate occurs primarily when the economy is doing well, suggesting that retail investors are optimistic and credit is flowing. However, this can also be viewed as a reverse indicator of what not to do. 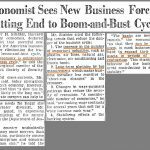 While the economy is performing well its important to increase savings, not decrease them, in preparation for what happens every single business cycle, a recession. Consumers only increase their savings rate after economic tragedy has struck, often time too late. As you can see from the chart below, the 4 week moving average of the jobless claims is at 244,500 which implies the labor market is strong. As you may have noticed, new cycle lows in jobless claims are achieved prior to a recession, however this does not indicate causation. This cycle has seen the jobless claims fall below the troughs of the prior 4 cycles. Too much good news doesn’t mean bad news is coming. 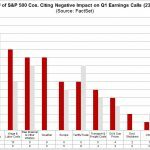 There needs to be a negative catalyst. Strong jobs reports and high consumer confidence reports occur before recessions, but happenstance doesn’t make for an adequate forecast. 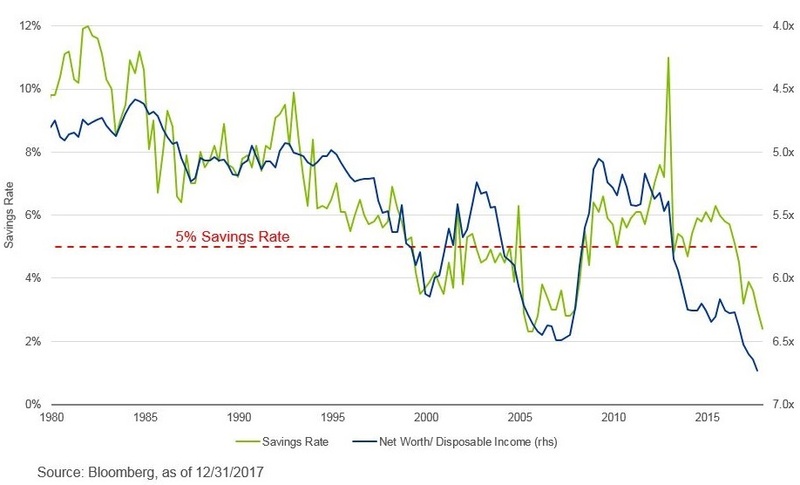 The savings rate is down since the beginning of the cycle partially because household net worth has been exploding with the increase in risk assets, particularly stocks. As you can see from the chart below, the net worth as a percentage of disposable income is at 670%. The inverted percentage has tracked the savings rate well historically. People think it’s less necessary to put money away in their 401K when the stock market is up 20% per year. This rationale only works when the economy is on the upswing. When asset prices fall, the savings rate increases to make up for the losses. The best idea is obviously to sell assets at the peak and save extra money to put in the market when it declines, but the aggregate cannot follow that plan. It’s also easier said than done. 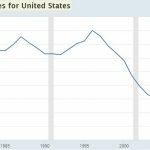 Just like how the good jobless claims and low savings rate don’t mean a downturn is coming until they reverse, the high net worth to disposable income ratio doesn’t indicate whether how to time the reversal in the trend, only that we are in the latter stages of the cycle, not in the beginning of it. While this business cycle had seen consumers take out less mortgage debt than last cycle, they have taken out more credit card debt. The consumer always levers up during expansions and de-levers during recessions. 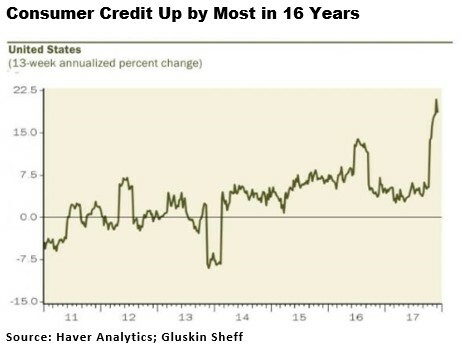 As you can see from the chart below, the consumer credit is up by the most in 16 years. Revolving credit (credit cards) was up $11.2 billion in November which was an annualized increase of 13.3%. The non-revolving credit (auto loans, and student loans) was up $16.8 billion in November which was a 7.2% annualized increase. The chart showing delinquencies increasing described the situation the exact opposite of reality. The desire for loans is increasing because the financial conditions are loose. The consumer is still levering up. The deleveraging which occurs after delinquencies start to increase hasn’t occurred yet. We’re towards the end of the cycle, not in a recession or very close to one. It’s easy to share information without thinking which is why the type of fruitless charts we’ve discussed in this article get shared. Linear thinking, when evaluating a complex system, only forces you to make significant mistakes which ultimately result in losses. If you are interested in more objective content, subscribe to our free email newsletter on upfina.com.